Welcome to the Water Clover RV Park and Campground! We are located on U-24, between Salina and Loa Utah near milepost 38. 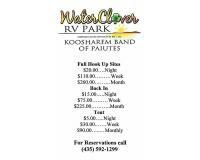 The Water Clover RV Park and Campground is 2 miles north of the U-24/U-62 junction near Koosharem Utah and 13 miles south of the U-119/U-24 junction. For Directions: Google Map "Koosharem Reservoir" from your origination. You may also contact the Richfield, Utah BLM Field Office for information about the beautiful Koosharem Reservoir. Koosharem Reservoir The Water Clover RV Park and Campground sits at the gateway to many exciting destinations, such as Fish Lake (18 miles), Capitol Reef National Monument (49 miles), and Bryce Canyon National Park (79 miles). We are located on U-24, between Salina and Loa Utah near milepost 38. The Water Clover RV Park and Campground is 2 miles north of the U-24/U-62 junction near Koosharem Utah and 13 miles south of the U-119/U-24 junction. For Directions: Google Map "Koosharem Reservoir" from your origination. You may also contact the Richfield, Utah BLM Field Office for information about the beautiful Koosharem Reservoir. Longitude 111.84556 / 111º 50' 44"
Latitude 184.53999 / 184º 32' 23"